The Nokia Lumia 920 – a smartphone that was expected to launch for $150 with AT&T, was eventually released for only $100 for anyone willing to commit to a 2-year contract with the carrier. Then a few days later, Amazon and Walmart stepped in by putting the handset on sale for even less – $50 dollars on a 2-year contract. But what do you do if you want to get a Lumia 920 on the cheap, yet you don't want it to be through a third-party retailer? Well, then you wait until Friday. 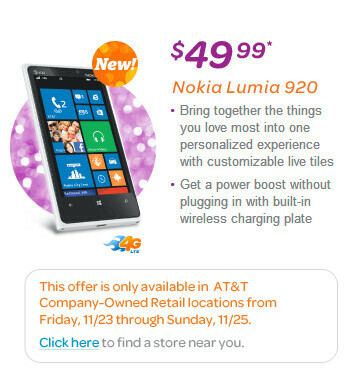 Starting November 23, the Nokia Lumia 920 will be available for only $50 at AT&T retail outlets nationwide. The discount, however, won't be permanent as the promo will run only until Sunday, November 25. 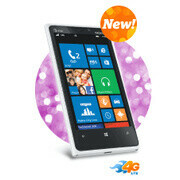 Moreover, the demand for the Nokia Lumia 920 has been pretty high, you better be quick if you want to take advantage of the deal. Don't forget to claim your Lumia 920 wireless charger before they run out! So there you have it – one more Black Friday discount that you might want to consider adding to your shopping list. In case you aren't sure whether this is the right smartphone for you, feel free to read out Nokia Lumia 920 review. Ok, how can they be selling something that's not in stock! Come on! Nokia say something you mother f**kers! Its almost a week and I'm still waiting for my red L920! What kind of a launch is this? There in stock here in Portland. hmmmm I love my WPs but um seems so wrong to sell it for this price on black friday only because there isnt any stock........or is there?????? Hope they restock a large amount in prep for Black Friday. Seems like the demand truly is overwhelming! I really wanted the 820, but if it is the same price as the 920 I might have to get that instead, though I hate large phones.